Hello ladies today I want you to try this for me. This is something I want you to try after your all done with you day and your at home by yourself and relaxing. This time is about you. First grab yourself a hair tie and place your hair in a pony tail, if you have short hair simply pin it back.. If you have make up on grab a face towel and remove your make up and your lashes. Remove your piercing and your ear rings. I want you to take a deep breathe clear your mind and look at yourself in the mirror. When you look at yourself what do you see? What does your eyes say? The expression on your face as you stare at this person in the mirror. Do you even know that person looking back at you? How many of you immediately looked at your flaws: Your pimples, scars ,dark marks or the fact that your eye brows needed to be done. Is that what you saw? Why is that the first thing you saw? Instead of how beautiful you are? Let me tell you what I saw when I first did this. The first time I tried to look at me the real me I broke down and cried I hated everything about me and my outer exterior I could see every dark mark, pimple and scar. I could see the discoloration in my face. I hated who ever I was looking at in the mirror. I wept at the fact that I saw a complete stranger. Afterwards whenever I got dressed for work I would wash my face, brush my teeth and make sure I didn’t look fully in the mirror. I would wait until I got in my car to apply my eye liner so I could only see my eyes and the darker the better because then people would see my eyes and not the ugly face attached to it. I could see my eyes because I never looked into my own eyes. The second time I gathered enough courage to try this again I stared at me and as the tears rolled down my face I could see past my face I saw me all I could see was all the hurt I hid behind a fake smile, the dark marks I had because I tossed and turned every single night. I saw someone who was broken and stopped loving who I was because I was lost I didn’t know how to. It was then as I was staring at this ghost in the mirror that I decided enough was enough. I had to admit that I was hurting but I reminded myself not for long, I would get through this. That I am beautiful in side and out and that the angry person I was on the outside only existed because that’s the only way I knew how to protect my inside. I had be in a war this whole time with myself and my life. Why didn’t I see a warrior trying to weather a storm when I first looked in the mirror I believe it was because I had to learn me to understand how to love me. I needed to stop fighting God and understand that he was working on me and my life I just didn’t agree with how he was doing it. I had to surrender and laugh at myself at the fact that God must have be shaking his head at me fighting him. I asked him to help me love me as he loves me. Every day now when I look in the mirror I love everything I am becoming and I love it. I am not broken, or holding on to anything. I see a person who wants what God has for me and that is the very best. I am whole and complete in him. 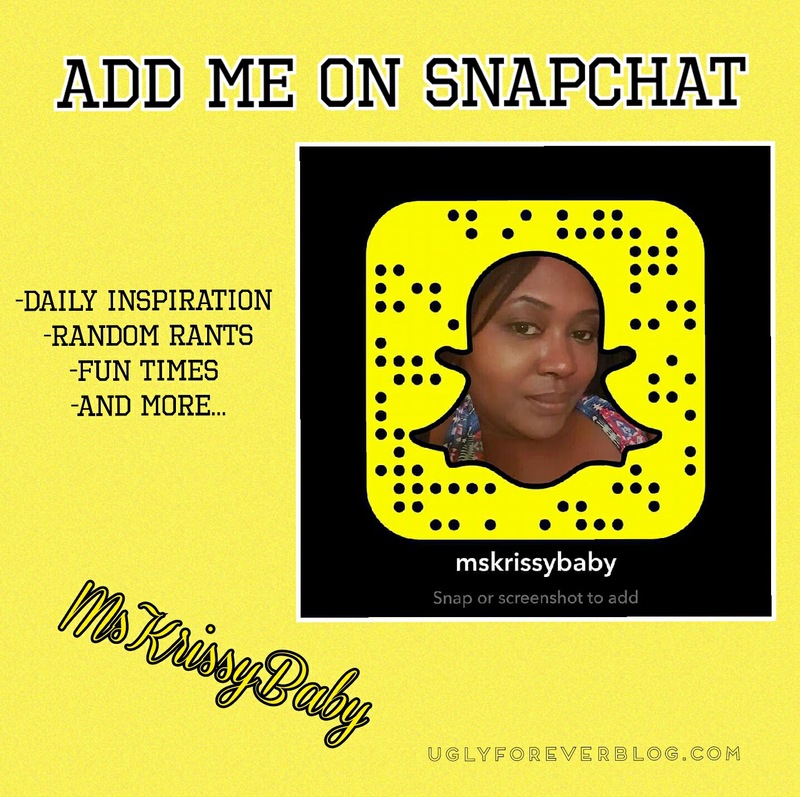 Posted in Feel It Fridays - Random Posts.Tagged Feel It Friday, Guest Post, Kai Carr, Krissy G, Love Yourself, Motivational, Self Esteem, Self Love, UGLYForever.